I’m not an expert on dubstep, but I've encountered it out and about, and it’s been an enjoyable romp… but now I hear it’s dead. Why? Because dub has hit the mainstream, and we know this because dubstep’s darker, discordant, bass-heavy electronica sound showed up a few months ago in advertising for Resident Evil, McDonalds… and Weetabix, of all brands. This represents a key transformation of dub style that’s been resented in some quarters- Twitter and the blogosphere have lit up with fury—dubstep is dead! DEAD I tell you! Of course, the question is, why does an association with some mainstream brands= death for the dub sound, rather than an association with dubstep= freshness for brand executions? Though the use of dubstep in a mainstream venue such as advertising can feel troubling to fans because it challenges subcultural ownership of the sound, this is also about the specific brands with which dubstep is being associated. Resident Evil – well, yes. The connections between gamer culture, tech, utopia, and darkness (thus the ever-present threat of dystopia that comes with surges of innovation and technology) are all there and fit dubstep’s dark electronic sound. But McDonalds? Weetabix? Using dubstep to represent these brands is a classic example of inverting key brand codes to disrupt and redirect consumer expectation. Each brand has varying levels of success with this approach. Despite their current call for adults to 'revolt and embrace lunch again', the core McDonalds brand is broadly defined by the promise of consistency, and satisfaction of simple, at times childlike pleasures and expectations. In the ad, this is manifested via easily recognizable components- a skater park shot with crystalline clarity on a bright day, and two young guys just hanging out and enjoying their Chicken McBites. But, this execution also features a dubby remix of the McDonald’s jingle and the two guys (Bones and Aaron- ‘extreme street dance’ celebrities) in a playful dance battle over the box of McBites. The dubby McDonalds jingle sounds somewhat McDonalds, somewhat not. The ‘extreme street dance’ style can only be described as making the body move in ways that don’t seem possible for human beings- again, familiar, but different. Both elements bring an air of the extraordinary and unexpectedness to the execution and McDonalds. But the thing is, these two components are presented as normal in this light, bright McDonald’s world, despite their unexpectedness. Even when it’s shown that the McBites inspire the street fight (essentially, the product making consumers do extraordinary things, catalyzed by the presumed deliciousness of the McBites), there is only a tenuous conceptual bridge for the viewer. By including these elements as just another everyday aspect of brand, the ad drives cognitive dissonance. How does the multi-textured dub sound and spectacle of Bones and Aaron moving their bodies into eerily impossible contortions correlate to the home of the Happy Meal or even Chicken McBites’ ‘great homestyle flavor’? Bones and Aaron are ‘home grown’ in a sense, self-made street performers known to a specific youth target- but since street dance is already their thing, the premise of the ‘product as catalyst’ falls down. In contrast, Weetabix maintains break-through, and skirts the dissonance caused by code inversion by framing out the dubstep moment into a more complete space of fantasy and performance facilitated by the brand. Here, dub is used to signal a shift from the real to the unreal. Framing, light quality, over-the top editing and the animated dancing teddy-bear crew make it clear that we’re viewing an alternate space where the rules are different and little girls dubstep powerfully. The execution is free to expose and explore new and interesting terrain for the brand (particularly energy, exuberance, joyful play), and celebrates dubstep along the way. The result broadens, rather than directly challenges brand expectations- since it’s acknowledged that there isn’t really a relationship between Weetabix and dub, but one is being created. I do think there’s a thought and lesson for brands here- understand the bounds of brand stretch, even in the case of code inversion – don’t ‘kill’ culture – find a way to leverage it that makes sense for the brand. The late 1980s and 90s were a golden era for psychopaths in culture. Psychopathy had become more widely understood and provided a fantastic popular vehicle for thrills in both fiction and film. In fact, this portrayal of the psychopath as obsessive and homicidal – in movies like Jagged Edge, The Silence of the Lambs, or Cape Fear – was simplistic. In the last ten years attention has begun to turn to corporate psychopaths who may be behind disasters like Enron and even the latest global economic crash. Now there is a new twist – psychopathy as a spectrum, and the notion of the ‘semi-psychopath’. Take an example from Horizon, the BBC’s flagship science documentary series. A recent episode covered good and evil, and one of the case studies was Dr James Fallon, a neuroscientist and world expert on the psychopathic brain. He had identified structural features in the brains of psychopaths that were quite unlike ‘normal’ brains. After realising that he was distantly related to a serial killer, Lizzie Borden, he decided to scan the brains of all his family members. There was one person whose brain had features consistent with psychopathy – his own. Neither he nor his family were entirely surprised as he had always been aloof, rather cool, and occasionally strangely intimidating. Dr Fallon hypothesised that the reason why he is not dangerous is that he had a wonderful upbringing. John Ronson’s book, The Psychopath Test, concludes that you can have ‘semi-psychopaths’ – people who are a definitely a bit psychopathic but not totally unsympathetic. Ronson also suggests that psychopathic traits do overlap with leadership traits – for example not being overcome by your emotions – and that it is crude reductionism to call people with these traits psychopaths. Ronson agrees with Fallon that the difference between a criminal psychopath and a corporate one is simply upbringing. Dr Fallon pops up again in a viral video clip after scanning the brain of Eli Roth, the director of horror films Cabin Fever and Hostel. Roth also has some ‘complicated’ results – if not unexpected given his profession – he has no emotional reaction to images of extreme violence. In the clip Fallon compares him to ‘Don Corleone’ – all the right instincts towards close friends and family, but a very different attitude to anyone ‘outside the tribe’. ‘Am I psychotic?’ asks Roth, probably rather disingenuously as he surely understands the difference between psychosis and psychopathy. This is when Dr Fallon utters a telling phrase. He tells Roth he is a ‘good psychopath’. His justification for this phrase? That psychopaths are essential to human civilization because they ‘make things happen’. Roth, clearly having a great deal of fun with the idea, recently tweeted: “Someone called me an hour ago and I had no idea who it was. We talked for ten minutes. #parttimepsychoproblems”. We are, perhaps, at a remarkable moment where psychopathy is being redefined in a much more nuanced way. It is now a spectrum, or even a matrix, of traits – and it is no longer synonymous with evil. One of our most prominent pop culture figures, TV talent show supremo Simon Cowell, can thank his prominence to character traits not inconsistent with the more neutral elements of psychopathy. The fact that his company is called Syco suggests he may not only be aware of this but have a sense of humour about it. This domestication of the psychopath may be part of a passage to a better society in which the nuances and ambiguities of human nature are much better understood. Or it may be playing with fire. Talk to a forensic scientist and they will not be happy. For the experts dealing with people who have committed the most gut-churning crimes, a psychopath is not someone who merely has certain brain furniture. What actually makes a person a psychopath is the upbringing that has shaped them in addition to that brain furniture. Eli Roth and Dr Fallon might be disappointed to hear it, but according this definition they are not real psychopaths. The author of this post asked to remain anonymous. What travels with the stealth of a Lexus and at Formula 1 speed and has a hospitality trolley? The Shinkansen, literally meaning “new trunk line” but very quickly dubbed bullet train by Western pundits, is an important semiotic property in Japan. The Super Express is a talisman that keeps Japan moving literally and mythically. According to Wikipedia: “The Tōkaidō Shinkansen is the world's busiest high-speed rail line. Carrying 151 million passengers a year (March 2008), it has transported more passengers (over 4 billion, network over 6 billion) than any other high speed line in the world” http://en.wikipedia.org/wiki/Shinkansen. These sleek trains were inaugurated in 1964 – a blue riband year for the Japanese in that it, very much like the 2008 Beijing Olympics, seemed to set the seal on the Japanese post war resurgence. Travelling at over 210km per hour, it was by far the fastest rail transport then available and must have impressed travelling visitors as to how far Japan had come. Whilst no longer on its own as the fastest train in the world (the French TGV is faster and China have a Maglev which travels at 420kmph, though the Japanese still hold the record for the fastest ever maglev), the Shinkansen is still a paragon of silent speed and service, with spotless safety record. Japan has a fleet of over 1500 Shinkansen trains that criss cross Japan every day taking Japanese businessmen from Tokyo to Osaka or reuniting families over the Golden Week or Obon holidays. The speed and perfect punctuality of the Shinkansen certainly seem to the outside observer as a reminder of the robust infrastructure underpinning Japan despite the long term recession and the 2011 earthquake, tsunami and nuclear radiation leak. It is the most palpable sign of technological prowess in a country that has lost some of its reputation for being vanguardist and visionary. It almost seems as if the Shinkansen train functions as an eternal rebuke to these doubts. It says something that the names of these trains depending on how often they stop on the trunk line, NOZOMI (meaning hope), HIKARI (meaning light) and SAKURA (cherry blossom) represent positive and galvanizing messages to the Japanese passenger and the public at large. The Shinkensen is a project that subject to continual renewal – the trunk line has just been extended into Kyushu and there are plans to build and extension to the most Northern island of Hokkaido as well as to upgrade the Tohoku line to faster speeds. As goes the Shinkansen line so goes progress in Japan. 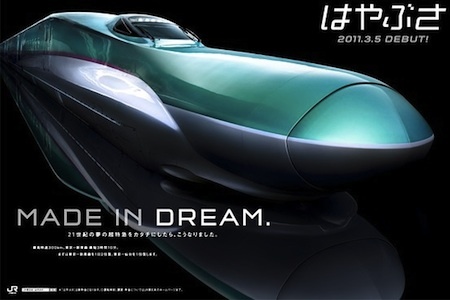 What is most noticeable about the representation of the Shinkansen is the idea of forward progress through sleekness and contemporaneity of its plastic design profile. From the needle like fierceness of the grey and blue 500 series to through the latest pantograph platypus billed 500 series to the outrageous, exaggerated nose cone of the E5, the design of Shinkansens, despite owing partly to aerodynamic logic is becoming increasingly aggressive; each design seeming to outdo its predecessor. The E5 being advertised as “Made from Dream” is actually positioned as more like a transatlantic or private airliner than a train – the seats will be lavishly upholstered and service to match – it is true that Shink travel has the best of flight without the hassles. Advertising by JR lingers languidly on the flaring and scalloped flanks of the train nose cones. The new 700 series and the coming E5 have become the centerpiece of promotional work that focuses not on where you’d want to travel but simply on riding this train. A pamphlet for a season ticket shows in aerial shot the immensity of the front section – like a sperm whale’s head with the sly concision of the canopy hood set off against the albumen like fuselage looking like something out of Star Wars. Another JR poster shows two E5s gracefully passing each other against a black background almost like two automated swans gliding on the tracks. Grace and functionality: two underlying values that are most prized in Japanese aesthetics. The thorax of the beast is very rarely shown. 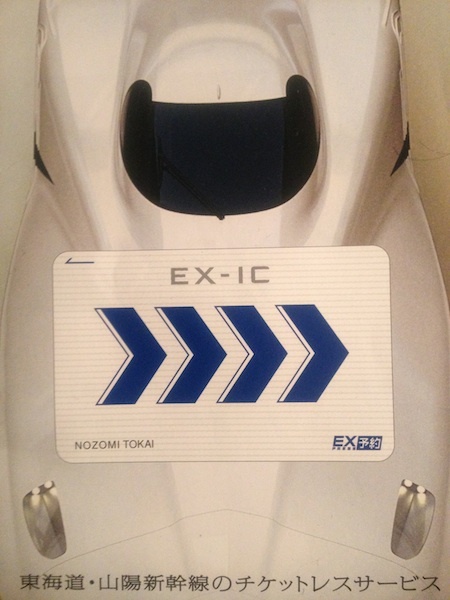 A semiotic perspective would suggest this is because the sinewy, muscular design of the Shinkansen seems totemic of the notion of forward propulsion. Shinkansen is an index for the future or at least a very strong metaphor for forward progress and a belief that the future is bright. On the pamphlet showing the E5 the arrows, pure indexes (as Peirce said, the sign that signifies not be convention but by blind compulsion), relate to the idea of speed but also to the idea of a smart card being a progressive idea for the new generation. My recent trip shows that the Japanese government and local tourist centres are assiduously promoting domestic tourism. Shinkansen ads in 2012 carry a new slogan that say (Nihon ni Tsunagou – “let’s join up Japan”) and on the flank of a Joetsu line Shinkansen was a message of hope to stricken prefectures of the Tohoku region. though Japan already perhaps the most comprehensive train coverage in the world. There is clearly a lot of goodwill towards the Shinkansen in popular culture. You can buy Shinkansen chocolates in long tubes at station shops, there is also a book and DVD made for children that goes through the chronology of the Shinkansen, the successive series and how they are assembled with a cockpit view. There is even a Shinkansen museum, I believe in Nagoya, where you can see the original 0 series snub nosed 1964 trains and learn about the background and the original blueprints. Whilst there has been some disruption to services and may be some trouble on the line ahead, nation Japan does not seem to be hitting the buffers quite yet and the Shinkansen – a bullet (train) that tapers at both ends – is a powerful semiotic force that acts as both persistent proof of this and as a motivating impetus into the future. Vehicles on Indian roads talk. Almost every vehicle is embellished either with images on the body or with accessories within. There is general disapproval for the plain vanilla factory made look. It is a rather inviting tabula rasa on which story of one’s identity must be etched. After all, buying a car is a milestone and historically it does mark the class transition from belonging to the plebian crowds who access public transport to becoming somebody who can afford their own private means. The nature of the images and the embellishment do tell you many stories. Stories about the life journey of the owner; how they got there and what they feel about it. How space is shared or rather grabbed on the road can be read as a mini snapshot of the class dynamics of this society. I will pick up two sets of vehicles and two popular images and embellishments typical to them. Privately owned cabs which are leased out to the driver and the mid range sedan which are favored by those who have recently risen above the harried middle class. Privately owned cabs for all practical purposes belong to the driver who works them hard so that he can have money left over after paying the daily lease sum and the fuel & maintenance costs. While on the face of it he can pull off a certain amount of status & posturing within his community about practically being the owner, the joy runs a bit shallow. He finds himself working harder & harder to beat the terms of the lease and save himself a respectable income. This pseudo ownership is nothing but a cuckold. The vehicle being experienced as a cheating girlfriend rings true at many levels. In a society where ‘ownership’ of a heavily bedecked woman lends status gives further credence to this parallel. Each cab is lovingly decorated with colorful tinselly frills and the stickers with sad romantic couplets complete the story of the driver being the jilted lover – all because he spends such long hours on the road. A pair of heavily made up blue eyes painted at the rear of the vehicle is significant at many levels. It is blue signifying the much desired white woman fantasy complete with all its loose morality associations. It is placed at the rear where it is looking on at the vehicle behind – at the ‘other’. 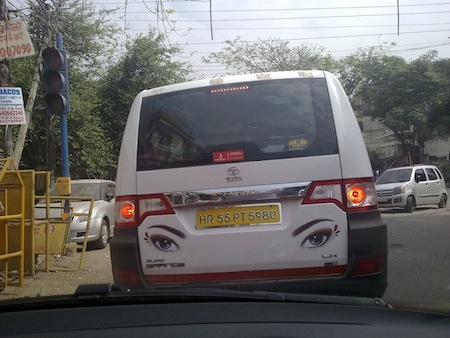 The eyes seem to guard the rear alluding somewhere to the vulnerability experienced on the road. Is it the vulnerability of the pretender? In contrast the theme of embellishment of the sedan alludes to the sense of snug security of those who have just arrived. The car is a protected cocoon, sealed off with its rolled up windows & tinted glasses warding off unwanted eyes looking in. Comforting softness of this world is further accentuated by velvet cushions and soft toys placed on the parcel tray, looking out at the world through the rear windscreen as though mocking the sweat, dust and grime of the road. It mimics the untouched innocence and hyperbolic snugness of the nursery. When these worlds come together, predictably there is mayhem which is known as Indian road traffic; also known as the most dangerous sport in the world! [Apparently it is drawing visitors from round the world as an extreme sport.] When the soft, pink cushioned world of the sedan mocks the violated fantasy of class transition, testosterone is bound to flow. 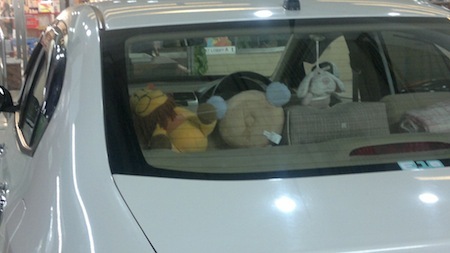 The rash and aggressive driving of the overworked cabs in turn mocks the fragility of the cushion & soft toy brigade. And the troubled co existence of the classes and masses that have been denied transition continues. The inaugural Semiofest will be taking place on 25th and 26th May in Westbourne Studios London; it is being organized on a shoestring budget and has been variously billed as an experimental learning event, symposium, swap meet for semioticians. I believe that Semiofest, “a celebration of semiotic thinking”, is not a radical idea, it is simply an idea whose time has come…The key to this from my perspective is to have an informal space to share and celebrate semiotic thinking. My observation would be that not only does commercial semiotics have no formal representation but that there is a gap between applied marketing semiotics which is usually hidden and proprietary and academic semiotics which in print and at a conference is usually geared towards rehearsing the validity of a theory and name checking hallowed academic authorities. Semiofest is first of all created to fill this gap, to give a formal space to commercial applied semiotics across the gamut of its applications from design to social media. The ethos behind Semiofest is essentially the same as that behind the Semiotic Thinking Group on Linked In. the STG was launched with no fanfare and a rather dodgy logo in March 2010. From inauspicious beginnings it has since grown to a group of over 1200 members hosting lively debates on the meaning of Britishness, the latest Cadbury’s ad, the difference between premium and luxury codes, online social networks and hidden signs on Facebook. It is a group comprised of an eclectic cohort of market researchers, academics, brand consultants, students and hobbyists. The Semiotic Thinking Group was set up to share idea about semiotics, to network and start to build a bit of esprit de corps amongst semiotics practitioners. The most common posts seem to be aimed at debating ideas, sourcing strategic partners in obscure markets and posting content, either texts or blog posts for comment. Several practitioners have messaged me privately to praise the quality of conversations on the STG and to say that it is the most zestful and exciting group they belong to. The germ of Semiofest was planted when a Canadian collaborator Charles Leech mailed me to say that he felt that his semiotic arsenal needed updating, that he did not know where to go to feed his mind and why didn’t we do some kind of meet up. I agreed it was a natural progression to create a physical manifestation of a successful online community. I was volunteered help by an informal organizing committee of collaborators from LinkedIn: primarily Hamsini Shivakumar, Lucia Neva, Kishore Budha and Sandra Mardin. We posted a short announcement of intention with invitation to express interest back in June 2011 and we got an immediate and enthusiastic response. We quickly received up to 70 ticket purchases on Event Brite and then set up the website and have been receiving bookings since over Paypal. \At the time of writing we have over 20 presentations planned – one being done remotely from Singapore, as well as over 50 tickets sold for the event. We have participants coming in from Brazil, Japan, Estonia, Australia, North America and all over Europe. Presentations are varied and represent the cutting edge of the field. They are on topics from text mining to design rhetoric to advertising to the semantic web. We have two keynote speakers, a co-creation slot and even some semiotic art. The other important facet is the educational halo that the event will hopefully create. We plan to post up presentations and disseminate learning post event through the semiofest.com site. 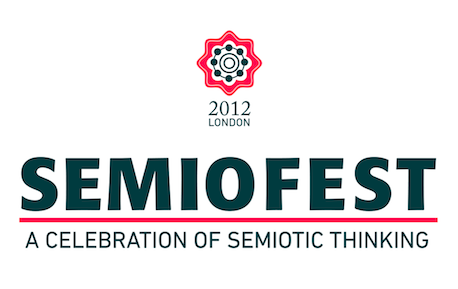 Inaugural Semiofest in London 2012 is an experimental event. We do not know how it will end up going but we are confident that it will give those attending a chance to enrich their perspectives, network and to enjoy a fun event. We have planned for it to be a convivial event with a Cultural Programme in the evening and hopefully the London weather will deliver balmy summer evenings. We still have a few tickets left so if the above sounds of interest you should quickly go to semiofest.com, go to Payment page and claim your ticket to this special event. The trend for poetry in British advertising isn’t going away. It bubbled up a couple of years ago, with the McDonald’s ‘Just passing by’ ad, and the Pete Postlethwaite-voiced script for Cathedral City cheddar. Along with ads by Waitrose, the AA and Centre Parcs, this caused extensive soul-searching at the time about whether this was debasing a great art, or a welcome way to popularise the medium. The adverts vary in quality, but it’s interesting to reflect on why poetry, at least in the judgement of these advertisers, fits with the commercial imperative. One of the reasons must be its disruptive effect. A working definition of poetry could be ‘disrupted prose’. Which is to say, language where the conventional prosaic flow from one clause to the next is disrupted by formal elements: rhyme, rhythm, wordplay and a heightened awareness of the sound and shape that words make. Of course, there are some writers who deliberately challenge this definition, pushing the boundaries of prose to breaking point, or writing prose poems that exhibit none of the qualities normally associated with poetry. But such forms draw their power from the expectation they’re subverting. The disruptive nature of poetry is a useful tool for advertisers, always keen to jolt a passive audience into paying attention. I’ve noticed it myself while tapping away on the laptop with the TV on in the background. You’re aware of the usual burble of commercial messages during the ad breaks, but when that burble turns into poetry, a different part of your brain responds. Despite yourself, you start anticipating the next rhyme or subconsciously bouncing along to the rhythm. Which isn’t to say these ads are either enjoyable or effective. The Iceland and Premier Inn ads work well enough on their own terms, albeit in a fairly conventional way. The Santander ad disrupts in an unwelcome way, like someone prodding you repeatedly with their finger. There is a craft to writing these advertising poems, and it’s a tricky thing to pull off. A Wordsworth or Byron doesn’t have to worry about ticking off various parts of the target demographic, or covering off key selling points. But the commercial writer does, and too often it shows. The rant would be funny enough in prose, but Charlie Brooker – uncharacteristically for him – chose to cast it in poetry. The sheer craft is something to admire, often relying on an unexpected rhyme rather than the obvious choice – a lesson the Premier Inn and Iceland writers could usefully learn. But casting the rant in poetry also elevates it into something more than a funny piece to camera. It becomes a self-contained piece of performance art, which predictably ‘went viral’ on Twitter and YouTube. Again, this points to the power of the poem – its origins in oral tradition suggest that it has always been a ‘viral’ form, explicitly designed to make language more memorable and shareable. Advertisers have long understood the mnemonic power of rhythm and rhyme when it comes to the shorter form: slogans and jingles. Such slogans have gone out of fashion, seen as being crass and unsophisticated. But extending the practice into a full-length script is the acceptable modern-day alternative. RKCR/Y&R, the agency behind the Premier Inn ad, explain on their website that they chose the poetic approach because of its power to make a ‘deeper emotional connection’. It appears that this is where poetry now sits in the popular imagination – a form of language to which we turn in times of emotional need: weddings, funerals and… selling mid-market hotel rooms. Like it or not, I suspect the trend will be with us for a while. Read more from Nick on the blog of his creative partnership Asbury & Asbury. There's always been something slightly sinister to Google Street View and it isn't just the surveillance aspect. Perhaps it is the perpetually sunny sky (Street View vehicles cannot operate in the rain) or maybe the navigation commands that never quite feel intuitive. Google Street View makes no effort to replicate the motion of how we typically experience the city — on foot or by car. A mouse click to the arrows on the ground jerks you forward at a distance far longer than the average stride. With a gravity of its own, impossible weather, and a population of spectral faceless beings — blurred to protect their identities — it is not a world anyone would ever like to live inside. Maybe your image exists in Google Street View already: blurred and frozen in time. "We call them echoes," says the mysterious woman in Escape the Map, the interactive video produced by Mercedes-Benz. She warns that "time works differently here" — you might find an image of yourself from four days or four years ago… but "relax." In the film, you are navigating a vehicle through a representation of Hong Kong on Google Street View. The woman — Marie — has just removed a mask that disguised her to look like the other blurry-face people outside. Now she sits in the passenger seat, offering instructions to "escape the map." You risk getting captured by the camera, which will turn you into one of the hopeless blurred people on the streets — faceless and trapped in motion like the victims of Pompeii. Google Street View is never named, but director Carl Erik Rinsch (soon to make his feature film debut with 47 Ronin) exploits all its familiar quirks. A character appears badly rendered and you instructed to "put him together" to advance. Giant red pins that look like Google Map markers come crashing from the sky. Google Street View could be a geospatial corollary to the Uncanny Valley hypothesis (which suggests that as artificial life grows more lifelike, it also seems eerier, more "uncanny"). In the Mercedes-Benz making-of video, the team explains how they mimicked Street View's aggressive navigation and used green screens to replicate its world. Interestingly, they point out the final touch was to "recreate the harsh midday light of the application." How ironic that advanced technology was employed to create the appearance of sunshine in Google Street View. It is unreality presented on a computer screen as the world outside our window. You are currently browsing the Semionaut blog archives for April, 2012.